Key Difference: An alloy is a metallic substance made by combination of metal with other types of elements. It is generally done in order to enhance properties like strength, ductility, corrosion resistance, etc. An ore is a natural source of mineral from which metals are extracted in order to gain profits. 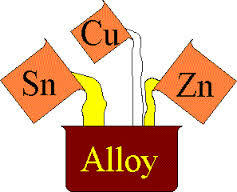 An alloy is made by the combination of metals with other metals or non-elements. The main metal which is being combined with other substances is known as the parent metal, whereas the other substances which are being mixed with the parent metal are known as alloying agents. The main reason of preparing alloys is for gaining or extending properties like strength, ductility, durability, etc. For example, steel is made by mixing iron with carbon. Carbon gives the toughness and tensile strength to the iron, and therefore steel becomes a tough product. On the other hand, an ore is source of minerals which occurs naturally. It is usually found in forms of rocks. Ores differ in richness from one another as it depends upon the mineral content present in the ore.
Ores are extracted for these minerals as it is a financially profitable business. An alloy and ore is often compared as ore also tends to contain a metal or a compound of some metal in excessive amounts. A rock is only termed as an ore after considering determining factors like location, supply and demand, etc. Therefore, both have their own importance. Alloys are generally made by mixing metals in their molten form. However, an ore occurs naturally. 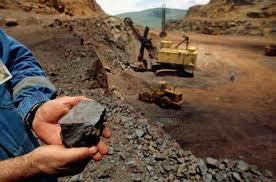 The ore is extracted for the valuable material present in it , as it also contains some other unwanted rocky material. It may use chemical methods also for extraction. However, majorly physical means are widely employed - like in the case of froth flotation, where the ore is crushed and then treated with something which creates a bond between the particles of the metal compound and at the same time converts these particles into hydrophobic. A foaming agent is used to pick the metal compound from the container containing treated ore and water. Air bubbles collects these metal particles and are collected from the sides of the container. .Stainless Steel alloys are used in various commercial applications like cutlery, making tubes, etc. Metals which are extracted from ores are used in various applications according to the characteristics possessed by them. For example, Aluminium derived from a bauxite ore is used in the production of containers, cosmetics and medicines.